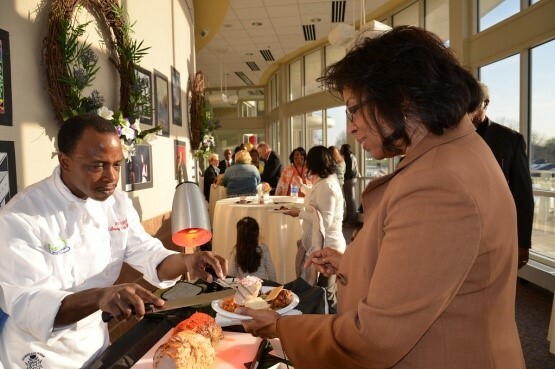 Rich Township High School District 227 would like to invite you to come enjoy a FREE hands-on culinary experience in our Rich South Culinary Kitchen taught by District 227 Culinary Superstar Chef Mark Crawford. Each session will teach critical skills. Be empowered with the skills you need to be a star in your own kitchen. Each course will include basic culinary laboratory meeting experiences to develop knowledge and understanding of basic food principles and applied nutrition. The course content includes preparation techniques, meal planning nutritional concepts, meeting health and safety needs, maximizing resources when planning, preparing and serving food, and analyzing individual and family nutritional needs. Please visit the District website to access the Eventbrite registration links for each Saturday session. Registration is open to all D227 parents of currently enrolled students at any D227 campus Rich Central, Rich East, or Rich South. 9:00 a.m. — 12:00 p.m.
Seats are limited and are on a first come first serve basis so sign up today. In the event registration is too low classes may be cancelled and registrants will be notified via email.